Neptune is the fourth largest planet in our solar system. About 60 Earths could fit inside. Neptune is named for the Roman god of the sea. The eighth planet from the Sun, Neptune was the first planet located through mathematical predictions rather than through regular observations of the sky. (Galileo had recorded it as a fixed star during observations with his small telescope in 1612 and 1613.) When Uranus didn't travel exactly as astronomers expected it to, a French mathematician, Urbain Joseph Le Verrier, proposed the position and mass of another as yet unknown planet that could cause the observed changes to Uranus' orbit. After being ignored by French astronomers, Le Verrier sent his predictions to Johann Gottfried Galle at the Berlin Observatory, who found Neptune on his first night of searching in 1846. Seventeen days later, its largest moon, Triton, was also discovered. Nearly 4.5 billion kilometers (2.8 billion miles) from the Sun, Neptune orbits the Sun once every 165 years. It is invisible to the naked eye because of its extreme distance from Earth. Interestingly, due to Pluto's unusual elliptical orbit, Neptune is actually the farthest planet from the Sun for a 20-year period out of every 248 Earth years. The main axis of Neptune's magnetic field is 'tipped over' by about 47 degrees compared with the planet's rotation axis. Like Uranus, whose magnetic axis is tilted about 60 degrees from the axis of rotation, Neptune's magnetosphere undergoes wild variations during each rotation because of this misalignment. The magnetic field of Neptune is about 27 times more powerful than that of Earth. Neptune's atmosphere extends to great depths, gradually merging into water and other 'melted ices' over a heavier, approximately Earth-sized solid core. 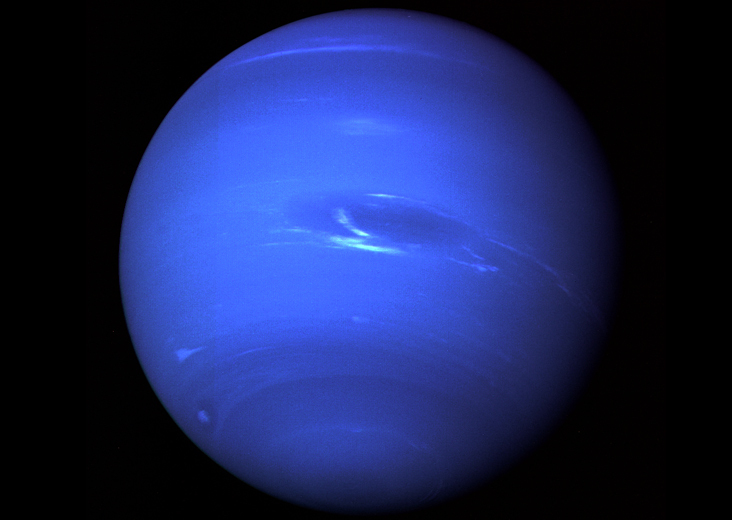 Neptune's blue color is the result of methane in the atmosphere. Uranus' blue-green color is also the result of atmospheric methane, but Neptune is a more vivid, brighter blue, so there must be an unknown component that causes the more intense color that we see. 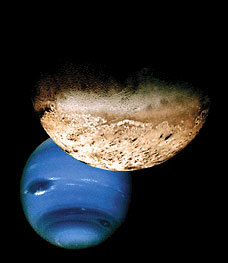 The cause of Neptune's bluish tinge remains a mystery. Despite its great distance from the Sun and lower energy input, Neptune's winds are three times stronger than Jupiter's and nine times stronger than Earth's. 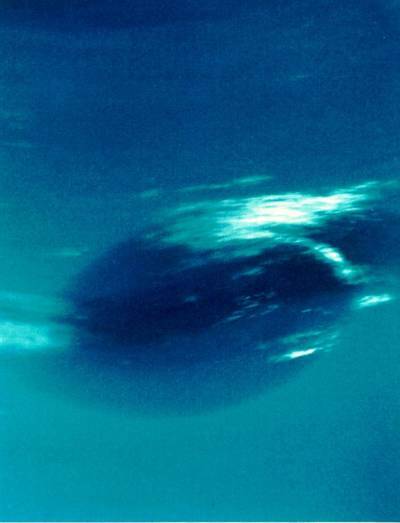 In 1989, Voyager 2 tracked a large oval dark storm in Neptune's southern hemisphere. This hurricane-like 'Great Dark Spot' was observed to be large enough to contain the entire Earth, spun counterclockwise, and moved westward at almost 1,200 kilometers (750 miles) per hour. (Subsequent images from the Hubble Space Telescope showed no sign of the Great Dark Spot photographed by Voyager. 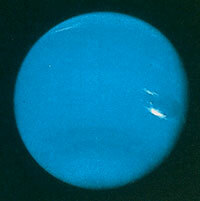 A comparable spot appeared in 1994 in Neptune's northern hemisphere but had disappeared by 1997.) Voyager 2 also photographed clouds casting shadows on a lower cloud deck, enabling scientists to visually measure the altitude differences between the upper and lower cloud decks. This photograph shows the last face-on view of the Great Dark Spot that Voyager will make with the narrow-angle camera. The image was shuttered 45 hours before closest approach at a distance of 2.8 million kilometers (1.7 million miles). The smallest structures that can be seen are of an order of 50 kilometers (31 miles). The image shows feathery white clouds that overlie the boundary of the dark and light blue regions. The pinwheel (spiral) structure of both the dark boundary and the white cirrus suggest a storm system rotating counterclockwise. Periodic small-scale patterns in the white cloud, possibly waves, are short-lived and do not persist from one Neptunian rotation to the next. This color composite was made from the clear and green filters of the narrow-angle camera. Neptune has 13 known moons, six of which were discovered by Voyager 2. The largest, Triton, orbits Neptune in a direction opposite to the direction of the planet's rotation. Triton is the coldest body yet visited in our solar system - temperatures on its surface are about -235 degrees Celsius (-391 degrees Fahrenheit). Despite this deep freeze at Triton, Voyager 2 discovered geysers spewing icy material upward more than 8 kilometers (5 miles). Triton's thin atmosphere, also discovered by Voyager, has been seen from Earth several times since, and is growing warmer - although scientists do not yet know why. Scientists believe that Neptune is made up chiefly of hydrogen, helium, water, and silicates. Silicates are the minerals that make up most of Earth's rocky crust, though Neptune does not have a solid surface like Earth. Thick clouds cover Neptune's surface. Its interior begins with a region of heavily compressed gases. Deep in the interior, these gases blend into a liquid layer that surrounds the planet's central core of rock and ice. The tilt of its axis causes the sun to heat the Neptune's northern and southern halves alternately, resulting in seasons and temperature changes. Neptune is surrounded by thick layers of clouds in rapid motion. Winds blow these clouds at speeds up to 700 miles (1,100 kilometers) per hour. The clouds farthest from Neptune's surface consist mainly of frozen methane. Scientists believe that Neptune's darker clouds, which lie below the clouds of methane, are composed of hydrogen sulfide. In 1989, the Voyager 2 spacecraft found that Neptune had a dark area made up of violently swirling masses of gas resembling a hurricane. This area, called the Great Dark Spot, was similar to the Great Red Spot on Jupiter. But in 1994, the Hubble Space Telescope found that the Great Dark Spot had vanished. Neptune has 11 known satellites. Triton, Neptune's largest satellite, is about 1,681 miles (2,705 kilometers) in diameter and about 220,440 miles (354,760 kilometers) from Neptune. It is the only major satellite in the solar system that orbits in a direction opposite to that of its planet. Triton has a circular orbit and travels once around Neptune every six days. Triton may once have been a large comet that traveled around the sun. At some point, Neptune's gravity probably captured the comet, and it became a satellite of Neptune. Scientists have discovered evidence that volcanoes on Triton once spewed a slushy mixture of water and ammonia. This mixture is now frozen on Triton's surface. Triton has a surface temperature of -390 degrees F (-235 degrees C), the coldest known temperature in the solar system. Some volcanoes on Triton remain active, shooting crystals of nitrogen ice as high as 6 miles (10 kilometers) above the moon's surface. 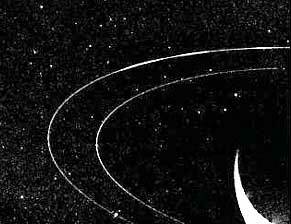 Neptune has three conspicuous rings and one faint ring. All of these rings are much fainter and darker than the rings of Saturn. They appear to consist of particles of dust. Neptune's outer ring is unlike any other planetary ring in the solar system. It has three curved segments that are brighter and denser than the rest of the ring. Scientists do not know why the dust is spread unevenly in the ring. Neptune was discovered by means of mathematics before being seen through a telescope. Astronomers had noticed that Uranus, which they thought was the most distant planet, was not always in the position they predicted for it. The force of gravity of some unknown planet seemed to be influencing Uranus. In 1843, John C. Adams, a young English astronomer and mathematician, began working to find the location of the unknown planet. Adams predicted the planet would be about 1 billion miles (1.6 billion kilometers) farther from the sun than Uranus. He completed his remarkably accurate work in September 1845. Adams sent it to Sir George B. Airy, the Astronomer Royal of England. However, Airy did not look for the planet with a telescope. Apparently, he lacked confidence in Adams. Meanwhile, Urbain J. J. Leverrier, a young French mathematician unknown to Adams, began working on the project. By mid-1846, Leverrier also had predicted Neptune's position. He sent his predictions, which were similar to those of Adams, to the Urania Observatory in Berlin, Germany. Johann G. Galle, the director of the observatory, had just charted the fixed stars in the area where the planet was believed to be. On Sept. 23, 1846, Galle and his assistant, Heinrich L. d'Arrest, found Neptune near the position predicted by Leverrier. Today, both Adams and Leverrier are credited with the discovery. 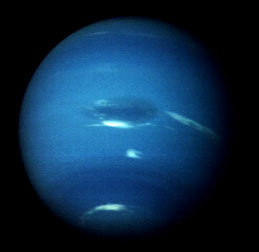 The planet was named for Neptune, the Roman sea god. In August 1989, the Voyager 2 spacecraft provided the first close-up views of Neptune and most of its moons. The spacecraft also discovered the planet's rings and six of its moons -- Despina, Galatea, Larissa, Naiad, Proteus, and Thalassa.